Have you ever heard of lycopene? If not, it is high time you learn something about it and give your our body all the wealth this powerful antioxidant is endowed with. It will reduce free radicals in your body and so prevent a range of diseases, but it will also slow down the aging process which is, as far as women are concerned at least, an important factor in life. Lycopene is a bright red pigment from the group of carotenoids, and the most famous food which contains this valuable phytonutrient is tomato. Other lycopene-rich foods include pomegranate, watermelon, red grapefruit, papaya and asparagus. Lycopene is one of those elements which body cannot synthesize, so we need to take it from food. Although some types of fruit and vegetables contain a significant amount of lycopene, many studies suggest that absorption of the lycopene found in tomatoes is far greater in processed tomatoes, such as juice, pasta, even ketchup. Do you wonder why? During processing, the fruit enlarges meaning it has already started to degrade. But more importantly, lycopene changes its chemical structure during heat processing and as such is easily absorbed by the body. Given it is fat-soluble, the absorption can be improved if you add some oil during processing lycopene-rich foods. And if you haven’t realized by now, this means that pizza too has certain benefits. Peeled tomatoes we put on pizza can, therefore, be a great source of lycopene, and considering these tomatoes are low-fat, our body will have no problems to absorb it. On the top of all, tomatoes prevent cardiovascular diseases. 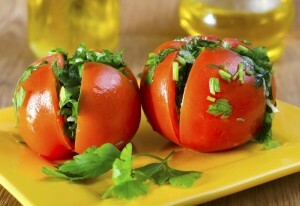 Being so potent antioxidant, lycopene is often considered the king of antioxidants. It reduces the oxidation of lipids in blood and so reduces the risk of cardiovascular diseases. Besides, it helps eliminate deposits within blood vessels, and this certainly prevents blood clots which may clog the arteries. Therefore, next time you want to take a slice of delicious pizza, maybe lycopene will ease your conscience at eating so many calories. Bordeaux is ‘hip’ – eat trendy colour foods!